Heat waves in India have become more extreme and significantly more deadly even with the relatively moderate amount of human-driven warming that has occurred over the past few decades, new research shows. Coming on the heels of President Trump’s decision to pull the U.S. out of the landmark Paris agreement, which seeks to limit that warming to 2°C above preindustrial levels, the study lays bare how even meeting that goal could translate to major health impacts in developing countries like India with large, vulnerable populations. “It’s very clear, we have very, very strong scientific evidence not only that global warming is already happening and that humans are the primary cause of that global warming, but that we are experiencing the impacts of that warming here and now,” Noah Diffenbaugh, a Stanford climate scientist who wasn’t involved in the work, said. The results also suggest that heat-related deaths could potentially rise exponentially if the greenhouse gas emissions that fuel global warming continue unabated, the authors of the study, detailed Wednesday in the journal Science Advances, said. That rising global temperature will lead to more, and more intense, extreme heat events is one of the clearest findings of climate science. Several studies have already found the fingerprints of the nearly 2°F (1°C) of warming over the past century in today’s heat waves. Further warming will only intensify the trend: A 2016 study found that heat waves that would typically only happen about once every 20 years now could become an annual threat for more than half the world’s land area if greenhouse gas emissions aren’t curtailed. India is one of the areas of particular concern because heat waves there can already reach eye-popping temperatures, particularly before the onset of the summer monsoon. Many of the country’s more than 1 billion people lack access to electricity and reliable sources of clean water. Such resources are particularly important to protecting those most vulnerable to heat-related illness — the very young, the elderly, and those with underlying medical conditions. Several heat waves in recent years have resulted in thousands of deaths, including in 2010, 2013 and 2015. In 2016, India saw its most intense heat wave on record, with temperatures in Jaisalmer in the northwestern state of Rajasthan reaching 126°F (52.4°C). 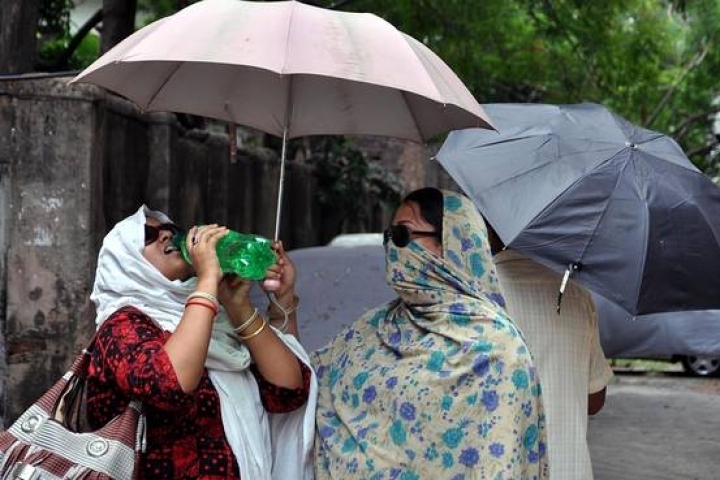 News reports of the “great impacts these heat waves are having in India” inspired Omid Mazdiyasni, a PhD student at the University of California, Irvine, to look into how global warming was exacerbating the problem. He and his colleagues looked at average summer temperatures from 1960 to 2009 and how they related to various heat wave measures. They found that the 0.9°F (0.5°C) temperature rise over that time resulted in an increase in the duration, frequency and intensity of heat waves in the country, particularly in the northern, southern, and western regions. They then used statistical analyses to show that that 0.5°C rise in temperature had more than doubled the odds of having a heat event that killed at least 100 people. Those odds also increased with the number of heat wave days. The results show that even that fairly modest rise in temperature “has actually quite a significant impact,” Mazdiyasni said. The results suggest that even meeting the 2°C goal of the Paris agreement — a goal already potentially in jeopardy with the U.S. withdrawal — could still cause a substantial increase in the risk of deadly heat waves in India, a well as other developing countries in the tropics and subtropics that have similarly vulnerable populations, Mazdiyasni said. Blowing past that goal, as would happen under current levels of emissions, could raise the risk exponentially, though the exact rate is uncertain. The conclusions of the study fit with those of other recent research pointing to the significant future risks of heat-related deaths with warming, including a 2015 study co-authored by Horton that factored in the exacerbating effect of humidity, which can shut down the evaporation of sweat from the body. That study also pointed to India as a particular hotspot of extreme heat. The deadly heat waves in recent years have led some cities in India to institute heat health action plans to better warn residents of the risks of heat waves. The city of Ahmedabad was the first to institute such a plan, after a 2010 heat wave killed 1,300. During a 2015 heat wave, the city of 7 million had only 20 heat-related deaths. Other Indian cities are now developing such plans. The new study suggests that these kinds of adaptation will be crucial to protecting the most at-risk people, even if the world acts to limit future emissions.